© 2016 Melissa Pagluica, "The Spindle Wheel"
Splöstlienne was a wasteland of thorns. Here and there, ragged yellow buds were emerging among them, but the cold winter kept them mostly bare. Matthias was a patient man. Being an eighth son, he had spent his life waiting for things a great deal—his turn at table, his turn at the bath, his turn to learn to ride. He had spent the time waiting as productively as he could, learning chess from his uncle, learning to fight from the stable hands, learning to whittle from the old men who sat outside the public house. He was a master of waiting. So, at the border of Splöstlienne—clearly demarcated by a very imposing line of gorse bushes that stopped abruptly at the edge of the neighboring kingdom of Rhem—Matthias made camp and settled in to wait. Matthias waited as other men came. Some were clearly noblemen, riding fine horses, wearing fine armor, seeking a bride and the honor of a fantastical rescue. They raised their swords and brandished them at the castle in the distance and then charged at the ocean of brambles, hacking at the thorny limbs. They made it a decent ways in before the brambles closed over them. There was an abrupt, aborted sound of pain, and Matthias would never see them again. Others were peasants seeking the wealth and prestige of a princess and her kingdom. They made their way into the gorse with hatchets or belt knives, but were invariably enveloped, too. There was, at one point, a man that Matthias suspected was a wizard—he stood at the edge of the thorns, commanded them to part, and strode in confidently, leaving a shimmering rope trailing behind him, presumably to find his way back out. The rope (and the wizard himself) became decidedly moot only a few moments later when the gorse swallowed him, too. The only things that made it past the gorse at all were birds. As the weeks passed and the gorse burst into golden flower, the sweet smell of something impossible for the prince to define swept through the air, and birds began to flock to Splöstlienne. Finches, cardinals, sparrows, nuthatches, chickadees all moved between the thorns with ease, building nests where no predators could reach them. It was this that gave Matthias his first inkling of understanding. Where is a bird safer than in a nest of thorns? He began to wonder, then, if this princess was under a curse at all, or if, instead, someone was protecting her, waiting for the right person to come, to prove himself worthy. Matthias had no idea what being worthy might mean, but the need to know caught his breath. Matthias packed up his camp the next morning and rode out, following the border of Splöstlienne. It was days before he came upon a cottage. It was a ramshackle thing, falling to pieces, but there was smoke coming from the chimney. When the prince rapped at the door, an old woman answered. "Yes?" she croaked, voice rough with disuse. Matthias begged her pardon, then said, "Why do you live here, at the edge of this wasteland?" The old woman smiled, eyes getting a faraway look to them, and said, a little dreamily, "Oh, in days gone by, I tended the forests here, and it was beautiful. It was no wasteland then, child." It was days more before he found another cottage. This was a farmhouse, and gorse bushes grew right up the side and over half the windows. "Oh, my child, in days gone by, I tended the fields and farmlands here, and it was beautiful." Matthias rode on, and came by nine more homesteads, each with a solitary old woman inside. Each told him something like the same, and he began to wonder if perhaps they were all actually the same old woman, a witch of some sort, playing games with him. At the twelfth cottage he came to, he was met with another identical old woman, and even the patience of an eighth son ran short. "Stop your tricks, witch! I demand to know how to reach the princess!" he snapped, looming down at her with a scowl. The old woman only snorted and slammed the door in his face, which, Matthias supposed, served him right. He waited a few days before he returned to the cottage, contrite, with a brace of hares as an apology. "I’m sorry," he said, when the old woman answered his knock. "I shouldn’t have shouted, or called you a witch." She shrugged. "Call me a witch if you like. My sisters and I have fallen to such things as mere healing brews and poultices in the days since the fall of Splöstlienne." A little helplessly, Matthias said, "I must get to the princess." The old woman raised an eyebrow. "Why?" There, Matthias stopped. None of the answers he had were good enough, would be the right answer if this were a puzzle to find a worthy man—curiosity, a desire to prove himself with the sharpness of his mind where he lacked the strength of his brothers, a desire to win, a desperation for some accomplishment or place in the world, a need to have all his endless waiting come to something, ever, at all. None of these was quite the truth, though. The fierce need to go, to do that had burned in his chest ever since the bard’s words was nameless for him, but no less fierce for being so. "I’m not sure," he admitted, spreading his hands in an empty gesture. "I suppose I simply need to know." The old woman smiled—a toothless, wrinkled smile that made Matthias at once very nervous and completely at ease, and he knew he hadn’t been terribly far off when he had called the woman a witch. "Good enough for me," she said, shrugging again. "And how do you propose to get there? And what will you do if you manage it? My sisters and I are a bit protective of the princess; one of us still stands guard in the tower." Matthias looked out over the fields of gorse for a long, long minute, watching the bees hum in the air and the birds dart among the thorns. "The briars swallow any man who seeks her," he said slowly, puzzling it out the way he did when he tried to anticipate his uncle’s next move on the board. "So I must be something other than a man." "I cannot guarantee," the old woman warned him, "that you will ever return to being a man if you cease to be one for any time at all. Such things are never sure." Matthias considered it. There was not much of a life in being the eighth of nine sons. "What is there to return to?" he asked, shrugging his shoulders. "What man have I ever been? Maybe I will be better as something else entirely." "You’re certain?" the old woman asked. Matthias knew, then, all at once and beautifully, that his place was in that tower, as the solver of the puzzle that others had approached as a battle. He didn’t need to be a conqueror or a bridegroom, but merely something small and somehow useful. "So be it," he said, nodding once, decisively, and closing his eyes. The old woman hummed a soft, low sound, and where Matthias had stood now fluttered a small, brown sparrow. She woke each morning and unrolled herself from the blanket of golden wool that she had woven. 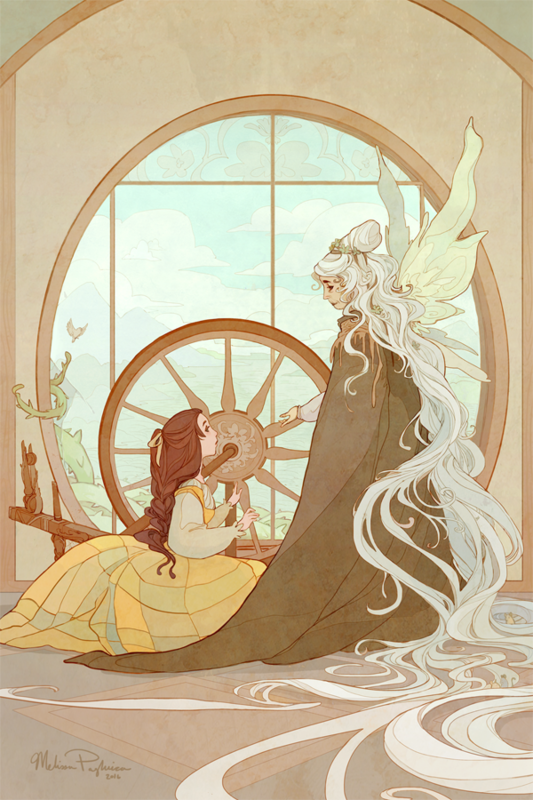 She rose from the bed she had made—gorse-yellow and stuffed with wool—and went to sit at Ioma’s feet. There she carded wool in the predawn light, endless wool, which never seemed to run out. After, she stood at the window as the sun rose, watching the light spill across the fields of gorse and listening to it sing. She basked in the sense of freedom, of safety, knowing that her people all stood as Ioma stood, safe and stony, frozen in the last moment of her life as a child. She could not fail them like this, could not trip in the footprints her parents had left for her to fill. Splöstlienne was safe, covered over, enduring and beautiful. She spun sunny lengths of thread each day, thread that sang songs of sweet things and unbridled joy, of strength and safety. She spun herself into that thread, too, stronger and tighter and more vast, until she was a dense forest of self, alive with singing birds and humming bees, sharp with thorns and bright with flowers. She spun herself brilliantly alive, until she needed no food but sunlight, no water but rain, and time floated by her like clouds, distant and unremarkable. It went on this way for countless days—or, if one tried to count them, something like the number of days that might add up to a century—until one morning, as the sun rose, there was a new sound in the sunrise. It was soft, feathered and familiar like all the birds in her fields were, but slightly strange. A sparrow sat on her windowsill, head cocked. He watched with shiny, bright black eyes, holding still, waiting. "You’re new," Jocelyn said to him, voice soft. She hadn’t spoken in a long time—she had sung, so her voice was rich and deep like bells and crystal, but no words had crossed her tongue since her last apology to Ioma. Birds had nested on her teacher’s shoulders, in her hair, and Jocelyn hadn’t begrudged them their homes there any more than Ioma had begrudged the spiders and mice that had once held their place. But this sparrow was different, not one of the tower sparrows, not a bird of Splöstlienne at all. His song—the sound as the sunlight hit him, oh, it was different. Jocelyn let him be, not wanting to startle the small creature, and sat down to spin. She spun for hours, until the sun had receded into salmon-colored clouds. It was only then that she stopped spinning, running out of one length of roving, moving to pick up another, and noticed the color of her thread had changed. Where all the other spools had been endless gold, this one was speckled with tawny brown. Something sparked beneath the princess’s breastbone. It was a kind of elation and terror at once—there had been no change for years, and any such thing, now, was terrifying. But oh, even a favorite song, a favorite color, a favorite smell grows old with knowing it too long and too well, and that tawny flecking was a kind of beauty half-remembered from a childhood when Jocelyn had learned other arts, had heard other songs, had walked in fields and stood in dark forests thick with secrets. It made her hungry for something deeper than food—change. Company. Perhaps, very far off in the distance, a wonder about what it might be like to grow up. Curious, heart beating fast, Jocelyn turned to the sparrow, who hadn’t moved from his perch. "Oh, little thing, what have you done?" she asked him, putting out her hand, fingers trembling. The sparrow hopped onto her outstretched forefinger. Carefully, Jocelyn raised her hand up to where she could examine him better. She hummed the song of sparrows at him, the songs of their feathers and their tiny, hollow bones. The sparrow did not hum back. Jocelyn looked at the statue of Ioma and said to it—because she didn’t dare ask the sparrow himself—"He isn’t a sparrow at all, is he?" The statue didn’t move, but Jocelyn suspected that the birds nesting on it were giving her exasperated glances. One chirped. Jocelyn looked back at the sparrow on her finger. "I wasn’t ready," she explained to him, voice shaking. "They left—my mother, and then my father, and then I was supposed to be queen—and it was so sudden, and so much, all at once." The sparrow waited, head cocked. Listening. Jocelyn had spent so long listening—her whole life, just listening and spinning—that she wondered how it might feel to be listened to, even for a moment, by something else who knew how. Even these small moments of being heard—for the first time, Jocelyn didn’t want to be quiet, didn’t want to only listen and hum the songs of other things, songs from outside herself, no matter how beautiful they might be. "I couldn’t bear the sadness," the princess said, half to herself now. "I couldn’t stand the sound." She hummed a little, trying to remember the songs of anything but strong brown thorns and golden flowers. So much of her didn’t want to remember at all, wanted very badly to stay just as she was. But the hunger was there, the hunger to remember what it was like to grow, to eat, to bleed, to smell things that weren’t sweet, to see things that were anything at all but gold and brown and the blue of the sky. "Remind me?" she begged the sparrow, a little desperate now that she’d got hold of the idea, terrified that if she waited, she would never want to try again. Softly, so softly, the sparrow chirped a brief little melody. It was nothing and everything all at once, a picture in sound of green grass beyond her borders, of hearth fires and men and women and food, of cottages and ramshackle ruins, of forests, of rabbits and deer and the howling of wolves. Picking up a new length of roving and sitting at the wheel, Jocelyn, even softer still than the sparrow, hummed the song back to him and pushed her foot down on the treadle. The next days passed quickly, Jocelyn feeling hollow-boned, light and somehow holy in the wake of the sparrow breaking her spell. When Ioma awoke and the stone crumbled from her features, when the gorse fields rolled back until they were merely a ring around the castle walls again, Jocelyn kissed her teacher on her wrinkled cheek, handed her the basket of roving, and left the tower room. She did not look back, even as she heard the old fairy laughing. At the bottom of the stairs, a footman met her and asked her when she would like to bury her father. "I am ready now," she told him, voice firm, though she was still shaking a little. The footman looked a little startled, but the princess and the sparrow on her shoulder stared him down until he nodded and trotted off to make the arrangements. Jocelyn floated through the castle then, listening with one ear to the sounds of her kingdom coming back to life, but finally speaking as well. The next day, the old king was buried beside Jocelyn’s mother. Jocelyn wept, and, for the first time, did not keep silent as she did so. Life resumed. The fairies took up their tasks, the farmers took up their plows, and the fishermen took up their nets and cast them wide on the green and singing sea. The first day after the burial of her father, Jocelyn walked on bare feet through the paths of the forest and ate fruits full of secrets. On the second day, she knelt in the halls of healing and hummed songs of solace to the sick among her people. On the third, she strode through the farms and fields, sowing grain. The fourth, she danced in the great hall with nobles and farmers alike. The fifth, she stood on the rocky shore of the sea and sang fish into men’s golden nets. On the sixth day, and the seventh, and the eighth, she took her turn at cooking great vats of soup for the poor, at gathering herbs on the hillsides, at stitching together a robe made from fabric she and Ioma had woven. On the ninth day, she played (a little clumsily) at a harp. On the tenth day, Jocelyn called rabbits from their warrens and pheasants from their nests as her people took what food they needed. On the eleventh, the princess knelt beside the castle maids and scrubbed the kitchen floors and swept the tower stairs. On the twelfth day, Jocelyn walked with the last of Ioma’s sisters into the throne room of the castle and took her place on the great carved seat that had once been her father’s. The velvet beneath her was worn thin, and the wood beneath her hands was smooth and shiny where her predecessors had rested their palms. She sat vigil through the night, Ioma and her twelve sisters kneeling around the throne room and humming soft songs, murmuring their wisdom into Jocelyn’s very bones. She was crowned on the thirteenth day, just before dawn. Ioma and her sisters blessed Jocelyn’s rule in turn, speaking each of her names, kissing her cheeks, and then turning to stand in a neat row, like pieces on a chessboard, behind her. Jocelyn herself stood, crown heavy on her head, facing her people as their queen. The sparrow lived on Jocelyn’s shoulder, beak to her ear, where he made soft sounds that painted pictures of things she had never seen—kingdoms far away, men she had never met, horses she had never ridden, mountains she had never crossed. In the days, she spoke to the sparrow constantly, taking a fierce joy in the way he waited as she spoke, the way he cocked his head, listening. At night, she kissed his feathered head, gratitude swelling in her chest for this small, simple thing that broke her free of her own fear. Each night, she crawled into a bed draped with blankets that were not gold, and she slept, as anyone would sleep, and dreamed. It was not particularly magical sleep, but sometimes, in the better dreams, she met a young man with a sparrow’s eyes, and sat across a table from him, a black and white board between them, and they played chess as he told her stories of faraway kingdoms and strange foods and drunken bards and eight brothers—seven older, one still very young. "Are you happy?" she asked him one night, looking up as her knight claimed his pawn. "I’m sorry you haven’t turned back." She didn’t know if it was because they didn’t love one another enough yet—she kissed his head each night, just to be certain—or if he was meant to stay a sparrow until some other thing happened, or if there was just no going back at all. He smiled, not looking up from the board, and she could see him ticking through strategies for the game. "I’m happy," he said, sliding his bishop across the board to claim her knight. "I like knowing I’m useful. And I’m very patient, you know. I’m the—"
"Eighth son of nine," she finished for him, smiling wryly and moving her queen. "I do listen, you know. Check."